The set does not show how many glasses are included. So, how many glasses come with the set? BEST ANSWER: Kristen, this set includes the decanter and 2 etched globe whiskey glasses. Hi I'm looking to buy the etched globes whisky decanter and glasses set. Do you ship to Australia? BEST ANSWER: Pour in a small amount of alcohol into the decanter. The alcohol will bond to the water and evaporate leaving the bottle clear. Is it glass or lead crystal? The Etched Globe Whiskey Decanter & Glass Set is made of lead free glass. etched glass...both were gifts and my friends were delighted. It is glass. It's lovely. I've purchased 2 sets as gifts. Our stopper just broke. Is there any replacement for the cork stopper? My glass cork with rubber stop keeps popping out due to pressure or something. Does anyone have suggestions so this doesn’t keep happening? BEST ANSWER: My suggestion is to wrap some Saranwrap, or even a rubber band, around the rubber stopper to stop it popping out. Hope this helps. 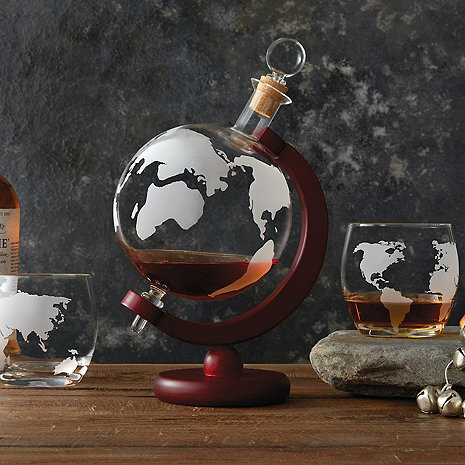 Can this globe decanter be personalized ? They look exactly as the photo, however, they are a tad bit smaller than expected. Still gorgeous, lovely with liquid in them. It was perfect. Exactly what I was looking for. Purchased 25. They were exactly as they were described. the glasses are amazing. I will definitely purchase from this company again. Great customer service. Extremely pleased with my purchase. Shipping was great, my purchase was received in just a few days (and it was during the holiday rush). I was concerned about the item breaking since it was very fragile, but the way it was packaged pretty much guaranteed it would arrive in one piece. The product was beautiful and completely met my expectations. This is an awesome gift. My fiancé loved it! To top it all off, I had ordered the combo gift sets (globe decanter and two glasses) and when I recieved it, I was missing one small piece for the decanter, I asked if I needed to send anything back or get something else to complete it and they said not to worry! They sent a while new decanter! This place rocks! I will be using them often!!! Decanter & glasses were fine, but stopper was cheaply assembled with the glass top glued sloppily onto an equally cheap cork. Had to search for a suitable cork replacement. It is smaller and much more fragile then expected and sorry I bought two. Also, the way it was described I expected the two glasses came with but NO GLASSES....luckily I bought 4 but they are more study than the decanter and the wobbly stand. The decanter and glasses are perfect. A unique piece for displaying and holding your favorite liquor. Got this for my son-in-law, he loves it! I'm sure we will be enjoying it when we visit!